In today’s world, people no longer desire mere products or services, they crave for experiences. The world is transforming into an Experience-driven Economy. Businesses are focusing on building experiences centered around the customer, consequently, reaping the benefits of this-greater customer satisfaction, reduced cost of acquisition, and increasing engagement. However, providing holistic experiences to customers is a challenge for the majority of Indian enterprises, and design firms with end-to-end UX Research and Design capabilities to meet this growing demand are scarce. Standing in sharp contrast is WinkTales–an Experience Design Company, providing full-scale User Experiences (UX) solution spanning UX Research, Design, Development, Testing and Optimization. WinkTales guarantees customers’ success by making the delivery agile and seamless. “Our value proposition to our clients is ‘Deliver to Delight’ – solve for results and walk the extra mile to do it, meaning we solve for the end goal rather than for what is just asked of us. 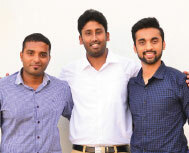 It is going this extra mile that puts a smile on our clients and their customer’s faces, making it all worth it.” mentions Prabhasa Kota, Co-founder and Director, WinkTales, having started it while pursuing his graduation. “We have been able to design the technology ecosystem for India’s leading Décor firm as their UX partners. We are also the communication partners for a global banking IT major and the Experience Design partners for India’s biggest corporate wellness service provider”, he adds. It is no surprise that they have been ranked the 2nd best UX Agency in India and 12th in the world by an industry renowned Agency Directory. In the last three years, this sector-agnostic venture has gained clientele from both enterprise and startup sectors across FinTech, Decor, Technology, Banking, Ecommerce, Cloud, and Healthcare. To deliver such rich solutions, WinkTales hires only the best pool of designers and experts across India. Considering employees as their greatest asset, WinkTales never tries to fit them into a bucket and allows them the freedom to explore, while charting out a personalized career path for each employee based on their interest and facilitating them to achieve their goal by assigning first-hand mentorship. A mark of their culture of being ‘Better than Yesterday’. Its employee engagement, benefits, and perks are best-in-class and based on its core value ‘Be Happy’. “Growing exponentially year-on-year, we are all set to introduce a new range of technology based UX products in the second quarter of 2018 and aim to become the world number one User Experience company by 2020.” signs off Alok John, Co-founder & Director, WinkTales. Breaking free from the clutter and standing apart, WinkTales’ research-driven User Experience is designed to make sure that its customers’ users fall in love with their product while being a strategic Experience Design partner to its clients.